There are many ways to lay out a palette, the most important things, in my opinion, are order and consistency. I generally like to have a warm and cool of each primary (red, yellow blue), and at least one of each secondary(orange, violet, green), tempered with a few earth tones(raw umber,yellow ochre, etc.) for convenience. Here is my current palette and how I lay it out. 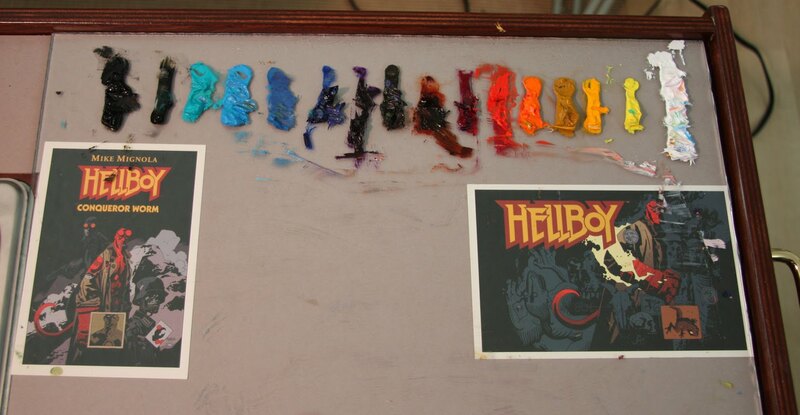 I like to lay-out my palette from right to left, warm to cool. While the colors may change slightly from painting to painting the lay-out always remains the same, so that I do not have to dedicate part of my thought process to finding colors. 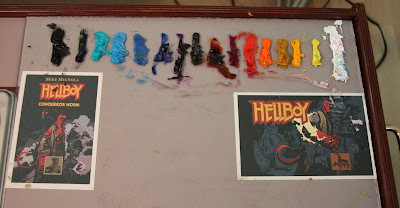 Starting on the right (all colors are Winsor & Newton unless otherwise noted) titanium white, cadmium lemon, cad yellow, yellow ochre, cad orange, cad red, permanent magenta, transparent red ochre (Le Franc), raw umber, winsor violet, french ultramarine, cerulean blue, space blue (Le Franc), cobalt turquoise (Grumbacher), sap green (often replaced by viridian if I need a more chromatic green), ivory black. I sometimes lay out a separate worm of titanium white off to the side for pure highlights. nice man - is the perm. magenta comparable to Alizarin Crimson ? I know the archival / permanence of Alizarin Crimson is very questionable, but I love it/need it and would need something close that resembles it , if I am to replace it. Hey Scott- It is my replacement, but I am not a good judge. I never particularly liked Alizarin, too staining. My wife likes Permanent Rose. I have heard good things about Permanent Alizarin from people who like Aliz. These are all rated permanence A by WN. I also know some people who like Red Rose Deep from DaVinci. I am not sure what the rating is on that though. I will bring as many of these as I can out to IlluXCon so you can at least see how they behave. Hey again Scott, My wife just got home and I asked her about this (she knows a fair amount about pigments) she says Permanent Magenta, Permanent Rose, Red Rose Deep all use quinacridone PV19 a dye based pigment similar in nature to thalo. Aww man - I did not expect such a detailed response. Many thanks to you and your wife - she knows her pigments! I'll gladly check out your palette at IlluXcon if you got 'em. I know the best thing is for me to try them out -since every painter has his/her own tendencies and what works for one person might be a disaster for another. Can't hurt to educate myself though and get opinions from smarties. Thanks again sir - very much appreciated ! Like the keys on a piano, keeping your color in the same spots soon makes it automatic where you dip into your colors. I look seeing palettes.